Pontos Requerido: 13250 O software não é compatível com dispositivos móveis e tablets. Por favor adicione este título à sua Lista de Desejos e inicie a sessão na sua conta the first club desde um computador para concluir o processo de solicitação. ABOUT PRODUCT Replaces 20 individual programs.Install on up to 6 computers. PC Check & Tuning 2015 offers more than any other tuning program: Save time and nerves with automatic system optimizations, adjust features and PC settings to meet your needs, and organize your PC. Work safely and smoothly on up to six computers. Clean PCClean your PC's registry and free up memory by deleting unn… ecessary or particularly large files. Speed up your PC	Defrag drives, optimize the startup and adjust power saving settings to improve performance. Secure PC	Update software and drivers, delete your digital footprint and restore accidentally deleted files. FEATURES Automatically find & solve problems Defrag computer Free up disk space Driver updates for over 50,000 devices Deactivate unnecessary services for improved computer performance High-speed mode for immediately more performance Power saving mode for longer battery life Delete your digital footprint and surf the Internet fasterNew in this version: Uninstall Wizard	Unused programs unnecessarily take up space and can slow down your PC. The Wizard recommends which programs should be removed. Modern user interface	PC tuning has never been so easy! The new program interface features a clearer design This allows you to easily find all features at a glance to start permanently improving your PC's performance. Multimedia Data Manager	Videos, photos and audio material take up much space on your PC. Filter according to file type and size in order to specifically find and delete unnecessary files and free up more disk space. More great features:Registry Booster	Removes unnecessary or defective entries in the registry and permanently stabilizes your system. Live WizardWorks away in the background and notifies you with pop-ups about problems and available optimizations. Customize Windows Adjust your system to match your personal requirements and gain access to hidden settings. 1-Year license	You get all the latest product updates and unlimited online support for a full year. TECHNICAL DATA Windows 8, 7, Vista, XP All MAGIX programs are developed with user-friendliness in mind so that all the basic features run smoothly and can be fully controlled, even on low-performance computers. Check your operating system’s control panel for technical information about your computer. Minimum System Requirements Processor: 400 MHz RAM: 250 MB Hard drive space: 60 MB for program installation Graphics card: Onboard, minimum resolution 1024 x 768	Internet connection: Required for activating and validating the program, as well as for some program functions. Software can also be used offline. However, please note that the program requires an Internet connection at least once a month to validate the license. 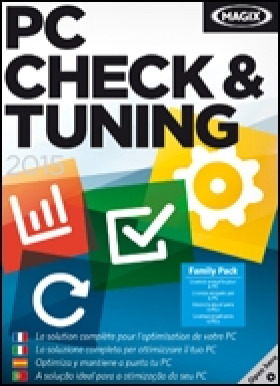 PC Check & Tuning 2015 is sold as a 1-Year license version. Extension for a bargain price. Family Pack refers to an extended license, which permits installation on up to 6 PCs.